St. Davids, PA – The Campolo Center for Ministry is pleased to welcome our first Visiting Campolo Fellow of the Spring 2019 Campolo Fellows Lecture Series to the campus of Eastern University and Palmer Theological Seminary. The Campolo Fellows Lecture Series for Spring 2019 is generously underwritten by our friends at the Eula Mae and John Baugh Foundation. These events are open to the public and all are welcome. We’d love to see you there! Rev. 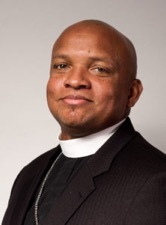 Cean R. James is Founder and Pastor of Grace Christian Fellowship, United Church of Christ (UCC) and Associate Conference Minister of Congregational Development Pennsylvania Southeast Conference, UCC. Christianity Unboxed: Modern American Christianity is as tribal as ever. The two big boxes into which most Americans try to fit, and sometimes force, their faith are “conservative” and “progressive.” Like any labels, these are both defining and restrictive. What might be possible if the church returned to the big tent philosophy of both/and, determined to be a church of Spirit and Truth? If you have any questions about the speakers or would like more details of these events, please don’t hesitate to contact, Campolo Center Executive Director, Robert Gauthier directly at rgauthier [at] eastern [dot] edu or 610-341-1715. WHAT IS THE CAMPOLO CENTER? Eastern University launched the Campolo Center for Ministry on July 1, 2014 to institutionalize and honor Tony and Peggy Campolo, each distinguished alumni, who have dedicated themselves to faithfully bearing witness to the Good News of the Gospel in their private and public lives. The Campolo Center seeks to identify, recruit, financially support and mentor students who demonstrate a calling, giftedness and commitment to vocational Christian service in a church or para-church ministry. We are committed to partnering with dedicated, spiritually-gifted, ministry-focused students, their family and home church, Eastern University and its network of donors. These partnership relationships will invest in the education, training and spiritual formation of servant-leaders for the church and para-church ministries. It is the vision of Tony and Peggy Campolo and a goal of the Campolo Center that Campolo Scholars graduate with as little student debt as possible. The goal is that these future leaders can fulfill their calling to vocational Christian ministry unencumbered by the burden of needing to repay student loans. To that end, the Campolo Center offers generous scholarships to students admitted into the Campolo Scholars Program. It is also priority to encourage, inspire and mentor the Campolo Scholars during their formative years at Eastern. To that end, we launched the Campolo Fellows Lecture Series to introduce the Campolo Scholars to faith- and thought-leaders influenced and inspired by Tony and Peggy, who share their vision for a holistic gospel that combines a personal commitment to Jesus and the pursuit of social justice. These leading communicators and practitioners of the faith are asked to engage the entire Eastern community in public forums and meet with, encourage and mentor the Campolo Scholars to use their gifts and training for the benefit the Church of Jesus Christ and all of God’s people.